You can use this chat in total anonimity. Take this oportunity to talk with other people around the world about your interest in : Thinking, Fast and Slow. An excellent book, I read a lot and this has to be one of the best books I have read. One to learn from. This is one of the best books I have ever read. Essentially it describes the current understanding of how participants in economics (and other human) transactions actually behave, as opposed to how a perfectly rational person would behave. The field is generally acknowledged to have begun with the author, Kahnemann, and his late buddy Amos Tversky. 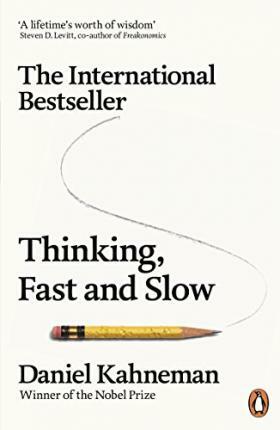 Bits of what they and others have discovered is mentioned in other books by people like the Heath brothers (in Decisive, for example) or Wansink (Mindless Eating) or Thaler & Sunstein (Nudge) etc etc. But here is the originator himself writing, giving a wonderfully clear summary of what types of questions researchers have looked at, and answered. And it's not just 'economics' - if you want to discover why golf pro's do better when they're trying to save par than when they are going for a birdie, read the book. Plus Kahnemann comes across as a decent bloke, with a nice sense of humor. By all means read other authors if you find them more entertaining - but this is one of the go-to guys for the entire field and he has done a top job, in my opinion.